Summary: After trained examiners and accomplished business professionals performed a thorough assessment of this work, Paul A. Akers has been selected as recipient of an internationally recognized award from the Shingo Institute, part of the Jon M. Huntsman School of Business. Akers will receive the award at the 29th International Shingo Conference occurring April 24-28, 2017 in Atlanta, Georgia. LOGAN, Utah — The Shingo Institute, part of the Jon M. Huntsman School of Businessat Utah State University, has awarded Paul A. Akers with the Shingo Publication Award for his book, “2 Second Lean.” Akers is founder and president of FastCap LLC, an international product development company founded in 1997. With over 2000 distributors worldwide, Akers and his wife built FastCap from their garage into a multi-million dollar company. People often ask, “Can lean be fun? Could lean be easy? Is it possible to get 100% participation?” The answer is a resounding, “Yes, yes, yes!” Paul Akers’ fast, easy-to-read book outlines how you can get any culture to engage in continuous improvement on a daily basis. That means everyone from the CEO to the janitor. All you need to do is make lean the first thing you do every day. Akers introduces a simple, four-step process that will produce the results we all dream of. This is not a results-based outcome approach; it is a daily process-based approach. In “2 Second Lean” you will learn how Akers’ journey unfolded and how he discovered this simple and fun concept to build a lean culture. Randall Benson, lean consultant and author of “The Quest Effect,” says, “This remarkable book stands out among the plethora of lean books. 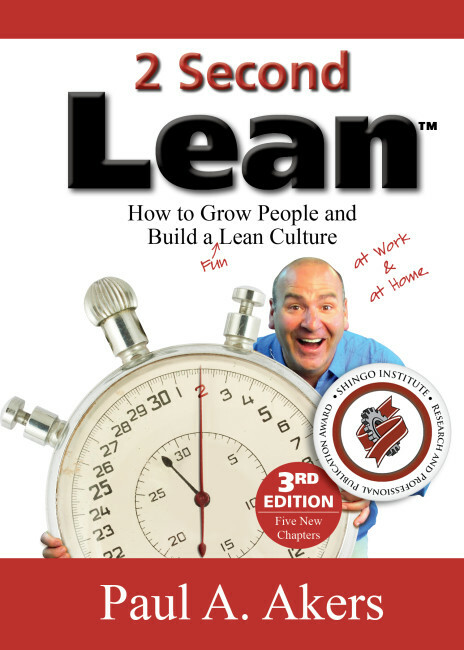 If you’re new to lean, get this book! If you’re a lean expert, get this book! Either way, it won’t disappoint.” By “challenging” or applying for an award, authors invite a group of accomplished professionals and trained examiners from the Shingo Institute to thoroughly review their publications. Shingo examiners select recipients based on a rigorous set of standards. Akers will receive the award at the Awards Gala of the 29th International Shingo Conference in Atlanta, Georgia the week of April 24, 2017. The conference is a five-day event featuring a selection of workshops, plant tours, keynote speakers and breakout sessions designed to provide ongoing knowledge, insights and experience for organizations in pursuit of operational excellence.